Endocrine therapy (ET) is one of the main systemic treatments for patients with breast cancer. To our knowledge, few studies have addressed the performance of ET or relevant influencing factors in cancer treatment in China. 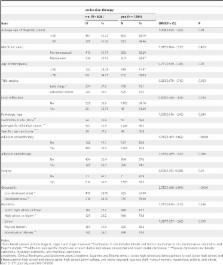 By retrospectively analyzing the clinicopathological data on breast cancer collected from representative hospitals of 7 traditional areas in China in one random month from each year between year 1999 and 2008, we found that: 1) The rate of the use of hormone receptor (HR) testing was 83.8% (3529/4211), with the estrogen receptor-positive (ER+) rate and/or the progesterone receptor-positive (PR+) rate being 67.9% (2395/3529), and the ER-PR rate being 32.1% (1134/3529). 2) Of the 1599 patients who had received ET, 999 patients (58.3%) were premenopausal while 600 (41.7%) were postmenopausal; 1598 patients received adjuvant hormonal therapy (AHT), whereas only 1 patient received palliative therapy. The medications mainly administered to patients were anti-estrogen agents (80.3% [1283/1598]), followed by AIs (15.5% [248/1598]). Of the 1598 patients receiving AHT, 1416 patients (88.6%) were positive for ER and/or PR, while 75 (4.7%) were negative for both and 108 patients (6.7%) had unknown HR status. The ratio of the use of endocrine therapy for breast cancer patients with ER+ and/or PR+ status was 60.0% (1416/2395). 3) Results from the logistic regression analysis revealed that geography, occupations, and history of chemotherapy and surgery were dependent factors affecting the application of ET in breast cancer treatment in China (P<0.001). In conclusion, the use of ET on Chinese women with breast cancer is increasingly and gradually accounted into the standardized process. Economic status, occupations, and history of chemotherapy and surgery were key factors affecting the application of ET. People residing in developed areas, engaging in mental labour, having history of chemotherapy and surgery are susceptible to accept ET. Quinquennial overviews (1985-2000) of the randomised trials in early breast cancer have assessed the 5 year and 10-year effects of various systemic adjuvant therapies on breast cancer recurrence and survival. Here, we report the 10-year and 15-year effects. Collaborative meta-analyses were undertaken of 194 unconfounded randomised trials of adjuvant chemotherapy or hormonal therapy that began by 1995. Many trials involved CMF (cyclophosphamide, methotrexate, fluorouracil), anthracycline-based combinations such as FAC (fluorouracil, doxorubicin, cyclophosphamide) or FEC (fluorouracil, epirubicin, cyclophosphamide), tamoxifen, or ovarian suppression: none involved taxanes, trastuzumab, raloxifene, or modern aromatase inhibitors. Allocation to about 6 months of anthracycline-based polychemotherapy (eg, with FAC or FEC) reduces the annual breast cancer death rate by about 38% (SE 5) for women younger than 50 years of age when diagnosed and by about 20% (SE 4) for those of age 50-69 years when diagnosed, largely irrespective of the use of tamoxifen and of oestrogen receptor (ER) status, nodal status, or other tumour characteristics. Such regimens are significantly (2p=0.0001 for recurrence, 2p or =70 years), progesterone receptor status, or other tumour characteristics. 5 years is significantly (2p<0.00001 for recurrence, 2p=0.01 for breast cancer mortality) more effective than just 1-2 years of tamoxifen. For ER-positive tumours, the annual breast cancer mortality rates are similar during years 0-4 and 5-14, as are the proportional reductions in them by 5 years of tamoxifen, so the cumulative reduction in mortality is more than twice as big at 15 years as at 5 years after diagnosis. These results combine six meta-analyses: anthracycline-based versus no chemotherapy (8000 women); CMF-based versus no chemotherapy (14,000); anthracycline-based versus CMF-based chemotherapy (14,000); about 5 years of tamoxifen versus none (15,000); about 1-2 years of tamoxifen versus none (33,000); and about 5 years versus 1-2 years of tamoxifen (18,000). Finally, allocation to ovarian ablation or suppression (8000 women) also significantly reduces breast cancer mortality, but appears to do so only in the absence of other systemic treatments. For middle-aged women with ER-positive disease (the commonest type of breast cancer), the breast cancer mortality rate throughout the next 15 years would be approximately halved by 6 months of anthracycline-based chemotherapy (with a combination such as FAC or FEC) followed by 5 years of adjuvant tamoxifen. For, if mortality reductions of 38% (age <50 years) and 20% (age 50-69 years) from such chemotherapy were followed by a further reduction of 31% from tamoxifen in the risks that remain, the final mortality reductions would be 57% and 45%, respectively (and, the trial results could well have been somewhat stronger if there had been full compliance with the allocated treatments). Overall survival would be comparably improved, since these treatments have relatively small effects on mortality from the aggregate of all other causes. Some of the widely practicable adjuvant drug treatments that were being tested in the 1980s, which substantially reduced 5-year recurrence rates (but had somewhat less effect on 5-year mortality rates), also substantially reduce 15-year mortality rates. Further improvements in long-term survival could well be available from newer drugs, or better use of older drugs. A comparison of letrozole and tamoxifen in postmenopausal women with early breast cancer. The aromatase inhibitor letrozole is a more effective treatment for metastatic breast cancer and more effective in the neoadjuvant setting than tamoxifen. We compared letrozole with tamoxifen as adjuvant treatment for steroid-hormone-receptor-positive breast cancer in postmenopausal women. The Breast International Group (BIG) 1-98 study is a randomized, phase 3, double-blind trial that compared five years of treatment with various adjuvant endocrine therapy regimens in postmenopausal women with hormone-receptor-positive breast cancer: letrozole, letrozole followed by tamoxifen, tamoxifen, and tamoxifen followed by letrozole. This analysis compares the two groups assigned to receive letrozole initially with the two groups assigned to receive tamoxifen initially; events and follow-up in the sequential-treatment groups were included up to the time that treatments were switched. A total of 8010 women with data that could be assessed were enrolled, 4003 in the letrozole group and 4007 in the tamoxifen group. After a median follow-up of 25.8 months, 351 events had occurred in the letrozole group and 428 events in the tamoxifen group, with five-year disease-free survival estimates of 84.0 percent and 81.4 percent, respectively. As compared with tamoxifen, letrozole significantly reduced the risk of an event ending a period of disease-free survival (hazard ratio, 0.81; 95 percent confidence interval, 0.70 to 0.93; P=0.003), especially the risk of distant recurrence (hazard ratio, 0.73; 95 percent confidence interval, 0.60 to 0.88; P=0.001). Thromboembolism, endometrial cancer, and vaginal bleeding were more common in the tamoxifen group. Women given letrozole had a higher incidence of skeletal and cardiac events and of hypercholesterolemia. In postmenopausal women with endocrine-responsive breast cancer, adjuvant treatment with letrozole, as compared with tamoxifen, reduced the risk of recurrent disease, especially at distant sites. (ClinicalTrials.gov number, NCT00004205.) Copyright 2005 Massachusetts Medical Society. A randomized trial of exemestane after two to three years of tamoxifen therapy in postmenopausal women with primary breast cancer. Conceived and designed the experiments: JL SlW PZ YlQ. Performed the experiments: CZ JjH PZ BZ HjY XmX ZhT HL JyL SlW PZ YlQ. Analyzed the data: CZ JjH JhF RH. Contributed reagents/materials/analysis tools: BZ HjY XmX ZhT HL JyL JjH JhF RH. Wrote the paper: CZ JjH PZ. Reviewed/edited the manuscript: JjH PZ. ¶ These authors are joint senior authors on this work. This study was financially supported. The review has sufficient funding support for initiation and management from The Chinese Cancer Foundation. The funders had no role in study design, data collection and analysis, decision to publish, or preparation of the manuscript.